Zinzino Review: Overpriced espresso coffee pods? Zinzino launched in 2007 and are based out of Gothenburg in Sweden. Exclusively targeting the European market (Norway is Zinzino’s primary revenue source, accounting for 35% of company-wide sales revenue), Zinzino operate using a parent company / subsidy structure. The company Zinzino AB is the parent and in each country Zinzino operate in a separate child subsidiary company is formed. Business activities commenced in autumn 2007. The principal activity of the business is to own and develop companies in direct marketing and related businesses. In 2009, Zinzino Nordic AB was acquired through both a directed issue in kind to shareholders in Zinzino Nordic AB and through the rights issue Zinzino Nordic conducted in December 2009. This gave Zinzino AB control over 97% of votes and 92% of capital in Zinzino Nordic AB. By December 31, 2012, participating interest had increased to 93% of capital. Since September 20, 2010, Zinzino AB has been listed on the Aktietorget stock exchange. Stock performance has been very positive, particularly over the past year. In 2011, the Group expanded with companies in Estonia and Lithuania. In 2012, companies were also launched in Latvia and Iceland. Unlike previous group structures, the new subsidiaries are directly owned by Zinzino AB. All Zinzino employees and distributors are well aware that our real boss is the customer, and everyone is familiar with our goal of 1 million customers by 2020. I wasn’t able to find a history on Pettersen MLM industry wise, indicating that Zinzino is his first venture on the executive management side of things. Read on for a full review of the Zinzino MLM business opportunity. Zinzino primarily market coffee, manufactured by Rombouts, ‘that was founded in Antwerpen, Belgium, in 1896′. Market wise Zinzino claim to be “No. 1 in Scandinavia”, and market their coffee in three ranges; Luxury, Exclusive and Premium. Zinzino coffee is sold in boxes of pods, ranging in price from 6.75 EUR (12 pods of Rombouts Columbia, Grande Reserve, Ristretto, Deca, Brasilia or Ethiopia coffee), to 8.50 EUR for some of the Premium blends (Malongo and Rombouts). Zinzino also market a range of teas (6-6.75 EUR for a box of 12 pods), along with beverage syrups (coffee flavours and others, 7.50 EUR a bottle), confectionary (chocolate based) and Espresso machines (269-1020 EUR), coffee cups and carry-bags. The Zinzino compensation plan primarily revolves around the purchase of products from the company, with volume tracked via a series of credits and points and paid out to affiliates via a binary compensation structure. All Zinzino affiliates are subject to ongoing monthly commission qualification. Regular affiliates must have at least four active customers and an autoship order that generates at least 10 credits. Executive affiliates must have at least ten active customers and an autoship order that generates at least 20 credits. Note that an “active customer” is defined in Zinzino as a customer who has purchased at least 3 credits worth of product over the last 90 days. Additional stars can be earned to an affiliates membership rank per new income center added that independently generates 200,000 credit points each month. Zinzino state in their compensation plan material that when a customer (affiliate or retail) purchases a product off the “partner price list” with an attached “customer offer” that generates cash. I had a look at the partner price list and the only products I could see with an attached “cash bonus” was the espresso machines (either by themselves or together with a monthly autoship order). The cash bonus ranged from 15 EUR (customer spends 205 EUR) to 110 EUR (customer spends over 1000 EUR). Team Bonuses are paid out to affiliates who have a specified number of active customers who also generate a specified number of credits via product orders each month. As per the Zinzino partner price list, effectively this means any customer who purchases an espresso machine. The Fast Silver Bonus pays out a 300 point bonus to new Zinzino affiliates who recruit at least two new affiliates and have at least four active customers in their downline, all of which generate a minimum of 750 credit balance in the affiliate’s first 30 days with the company. Monthly residual commissions in Zinzino are paid out using a binary compensation structure. 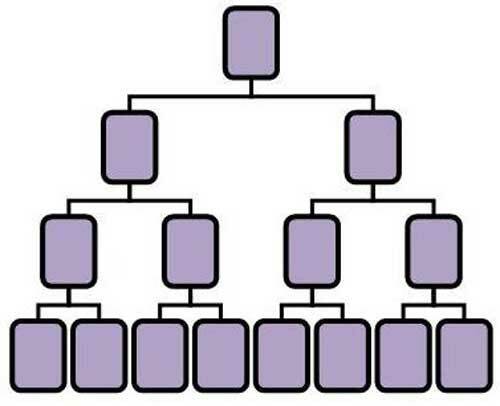 A binary compensation structure places an affiliate at the top of the structure with two positions branching out directly under them. These two positions form the start of two teams in the binary, a left and right team. Each position branches out into two more additional legs and so on and so forth down a theoretically infinite number of levels. Each position in the binary represents a recruited affiliate, with the credit volume generated within the binary used to calculate an affiliate’s monthly residual team commission. This is done by squaring off the volume generate between the two teams (left and right) against eachother. Volume is taken from each team at the end of the month, with no more than 2/3rds of the total credit volume counted is able to be sourced from the stronger of the two teams. How many credit points an affiliate is able to earn on is also determined by their affiliate membership rank. Additionally the commission percentage of said points is also determined by how many credit points an affiliate’s downline generates each month. Affiliates who qualify for the Fast Silver Bonus (Silver rank must be maintained), or have a 20 credit autoship order, 150 customer points in balance and at least 10 active customers, A-Team Bonus qualification or who are ranked Platinum or higher, qualify for double credit points on all new affiliate and customer autoship orders. The Residual Credits Bonus pays out double credit points on all orders, excluding Enrolment Credit Bonus orders. In order to qualify for the Residual Credit Bonus, an affiliate must qualify for the A-Team Bonus, or have a 20 credit autoship order, 500 customer points in balance and at least 10 active customers or be ranked at Director or higher. The Rank Achievement Bonus is paid out to Zinzino affiliates who achieve the qualifications required for the Director and above affiliate membership ranks. Note that if an affiliate loses their rank, they lose their monthly payments. Zinzino’s Customer Acquisition bonus revolves around credit points generated by customer orders and affiliate’s purchasing starter kits when they join the company. Points are tracked on each side of the binary weekly, with specified quotas equating to an increase in the points awarded. The Crown Volume Bonus is paid out to all Crown or higher ranked affiliates who have generated at least 10,000 credits in team volume. Despite the name and Zinzino compensation plan material displaying a phone, the zPhone bonus is just a 200 EUR a month bonus paid out to all Executive or higher ranked affiliates. A 1000 EUR a month car bonus is available to all Diamond or higher ranked affiliates. Zinzino state that their Director Trip is an annual “educational trip” where ‘partners get the opportunity to listen to fantastic speakers and get coaching from the best‘. Affiliate membership to Zinzino starts at 30 EUR, with affiliates able to purchase starter packs ranging in price from 499 EUR (Sales Partner – Oh Espresso) to 1795 EUR (Business Partner Coffee and Food). …and then there’s plans like Zinzino’s. Zinzino start off with your basic binary based compensation plan and then heap layer after layer of unnecessary complication on top of it. At its core the plan is volume based but how this volume is calculated is a nightmare. Customer and affiliate purchases generate credit points, which are then shuffled through the binary which is then converted into europoints, which an affiliate finally earns a percentage of as cash. Things get even more confusing when you consider that europoints do not have a fixed dollar value, but rather fluctuate between 0.90 EUR and 1.1 EUR per europoint. Qualification wise the Zinzino plan is just as messy. Take for example the signing up of a new customer and them making a purchase. By my count this triggers at least four separate components of the compensation plan, each with an individual methodology of commission tracking and qualification criteria. And that’s just one possible way to generate points! Unless you’re dealing with someone freakishly adept at understanding ridiculously complicated compensation plans right off the bat (or Swedish? ), you can forget about being able to clearly explain the compensation to them in any measurable capacity. They’re just not going to get it. Hell I’ve gone over my break down of it and I’m still not even 100% sure I completely get it. Between the cash bonus points, credit points, balanced customers, customer points, customer acquisition points, euro points and 16 affiliate membership ranks there’s just too much clutter. This might have passed a decade ago but simplicity has come along way in the MLM industry and today plans like Zinzino’s simply just don’t cut it. I’d strongly recommend on the corporate side of things either a complete re-write of the compensation plan in line with today’s standards, or an overhaul of the distributed compensation plan material (which co-incidentally is not provided to prospective affiliates on the Zinzino website). Having a terrible compensation plan is one thing but the material Zinzino provides to explain it is just as bad. In breaking it down I constantly found myself flying all over the place backwards and forwards trying to make heads or tails of what I was looking at. It is volume based but there’s no need to heap so much additional point conversions and “bank balances” etc on top of it. Keep it simple guys! On the other hand, if you are able to completely understand the plan as is or are content with the notion of “do stuff, get paid” being the extent of your understanding of the Zinzino business, I’d only then recommend analysis of the company’s products. Rombouts have their own independent website up at “rombouts.co.uk” and in comparing their prices with what Zinzino offer, I’m at a complete loss as to how these guys are still in business. Throw in the bulk discounts Rombouts are offering and the price difference grows even larger. Outside of those participating in the Zinzino business opportunity, I have no idea who is paying more for coffee from Zinzino than the manufacturer themselves are selling it for retail. Couple that with the outdated and complicated compensation plan Zinzino use and this is probably an opportunity best steered well clear of. Update October 25th – Following a change in direction of the company and new compensation plan, BehindMLM published an updated Zinzino review on October 25th, 2018. The brain behind Zinzino is Ørjan Sæle, well known for his previous MLM adventures in Nature’s Own and Seven. * to make it easier to distribute money upwards in the system. Norway is a typical “coffee country”, with 9.5 kg coffee per citizen per year (2011), 4,400 million cups of coffee per year (2011) / 4.78 million citizens total. It can also be defined to be 45 grams of coffee per day per adult citizen (over the age of 16-18 years). 4.8 cups per day for men, 4 cups per day for women. 98% is consumed at home or at work (29%), 2% is consumed at coffee bars (according to a local source, kaffe.no). 0.5% of total coffe production to 0.07% of the World’s population (2010). When I analyse it in that way there’s clearly a market there, also for over priced products. The general market recovered relatively quickly from the financial crisis in 2008, and have only indirectly been affected by problems in the rest of Europe. That means the market isn’t very “price sensitive”, it can accept over priced products to some degree. “Typical marketing junk”. Everyone can be “number one in Scandinavia” in something. There were some discussions about Zinzino in 2009 or 2010, but it has been relatively quiet after that. Coffee, due to Starbucks and other global distributors, is now a commodity, unless you really make yourself an exclusive distributor of SOMETHING. Tonx Coffee, for example, guarantees freshness… Freshly roasted beans that got from the field, roasted to your house in about a week (so they claim), and it’s a different type of coffee every other week… This week could be Ethiopian, next time’s Colombian… AND the price is quite competitive for fresh roasted coffee beans (you grind, you brew). But this? Why pay them when you can buy Rhom-whatever coffee directly? Do the sellers *teach* you how to get the most out of your coffee? How hard can it be? Hmmm? Is there a coffee “lifestyle” that one needs to learn? Is there a coffee “lifestyle” that one needs to learn? It actually is. I believe you definitely should try to learn it if you want to sell coffee rather than just recruiting income opportunity seekers. You can try to translate the disabled link “the art of making good coffee” I used as one of the sources in my previous post. You can compare coffee lovers to wine lovers, they’re willing to pay some extra if they believe the product is “unique” and reflects what they WANT to be (e.g. we have a real estate bubble in Norway, and people do still feel “rich”). Coffee is an almost perfect example of how half truths can be manipulated to trap the unwary potential MLM recruit. Coffee IS the second most traded commodity on the planet. Coffee IS Americas’ largest food import. There ARE over 130million coffee consumers in the USA. We are discussing “A” company attempting to enter an already saturated market with an overpriced product, without the benefit of mass advertising, with no advantages WRT cost, added value, exclusivity, ease of access, convenience of supply or health benefit. It expanded to Latvia and Iceland, not to the USA. You don’t sell coffee, you sell an Espresso machine plus monthly refills to that, if we’re talking about potential retail sales. So you don’t sell a commodity, you sell lifestyle and taste. That type of coffee only had around 1-2% share of the Norwegian market in 2006. It may have up to 3-4% market share now, so it’s clearly a niche product. That’s why I identified several different factors in the market itself, e.g. people do still feel “rich” there. M_Norway: So you don’t sell a commodity, you sell lifestyle and taste. If you are the man in the street looking to get into multi level marketing, you are selling an uncompetitively priced product into an oversaturated market without the benefit of mass advertising and/or ease of access/supply, but with an unwieldy compensation plan. Why go for the second most traded commodity in the world to sell through your multi level marketing company of choice ?? Anyway, why not go for THE most traded commodity in oil ??? The answer is applicable to both oil and coffee. A sales person will typically sell other people’s own IDEAS about something, what they want to believe about the product and what it will do for them. And those ideas can be both rational and irrational. That’s what MLM typically is about, selling people’s own ideas about how they eventually will make a huge income from it if they work hard and recruit a few other people. The idea isn’t very rational in itself, but people really want to believe in it. Oil can’t be sold in the same way. But you can find examples where oil companies have TRIED to use similar ideas, e.g. “branding” their own gasoline as “Formula Shell” or similar marketing names. But it usually won’t have much effect on the market. PRICE is simply a “mechanism”, one of many. Some people will actually become MORE interested if the price is high and less affordable for other people, e.g. so they can be among the first few ones affording to own or use the product. You probably know personally some of those people yourself? There’s more than enough of them out there. Nothing wrong with subscription coffee, but there better be some special hook to make me want to try it. Tonx, which I mentioned before, is super fresh beans delivered to your home biweekly, different crop each shipment. Whole beans, not grinded, but machines to do everything is not hard to find. That’s their “hook”. They’re offering something unique in the coffee world. Plenty of espresso machines are out on retail. Nescafe and other are getting into the business. Prices can only go down, which only makes the MLM side of the problem worse, as people look at it and say, why should I buy MLM when I can head down to local… Best Buy / Target / KMart and buy Nespresso there? The more stuff’s retailed (as a commodity), the worse it is for MLM. There’s just no profit margin to sustain MLM payouts. Plenty of espresso machines are out on retail. Nescafe and other are getting into the business. Prices will go down as they will for any other product (or actually most “mechanisms” will change). That’s why it’s an idea to recruit coffee lovers rather than income opportunity seekers in the first place, people who will continue to buy refills. It’s also an idea to check your local market before you join opportunities like that. Norway, Sweden, Denmark, Finland and Iceland are all among the top 6 “coffee lover countries” in the World, counted in kilograms coffee per citizen. Espresso machines will typically only get a tiny share of the total market. But espresso machines will be “high end” anyway, so it doesn’t really matter whether Nespresso is cheaper or more expensive than Zinzino. “High end” customers are much more willing to accept a high price than other parts of the market, if they like the product in the first place. In that part of the market, you’re selling “perceived quality” and “perceived value”. An expensive product can actually be much more attractive than a cheaper one. Zinzino is a pyramide scam. Their idea is not about selling coffee, it is about recruiting more persons to the pyramide. The compensation plan is made to be confusing and the price of the machine and coffee is irrelevant. You only get paid if you recruit more persons to the zinzino team. Zinzino is a pyramide scam. Now they have an omega 3 product. Is this company worth a second look? Please share your thoughts. Coffee “fortified” with Omega-3 fatty acids? Come on, what sort of SERIOUS COFFEE DRINKER would bother with fortified coffee? To them, ANY sort of additive is bull****. Just take some fish oil capsules, man. And buy some REAL coffee. The coffee is not physically mixed with the fatty acids, it’s just an additional product line. Zinzino bought the entire concept (Oil4Life) from an existing Norwegian company (Itogha) and increased the price to include it in their MLM concept. Zinzino also got Paul Clayton to recommend their product, he has also been connected to MonaVie and known for his claim that antibiotics would be useless within 2010. Had a request for an updated Zinzino review. Came up today but they’ve sinced “revamped” their website and now don’t provide a compensation plan. Tried searching but nothing recent came up. MLM company hiding its compensation plan = red flag. Can you make a new review about Zinzino now? Thanks for that. I’ll queue Zinzino for a review refresh.